﻿﻿﻿﻿﻿﻿﻿Head out west for a cool dip at Balmorhea and stargazing at the McDonald Observatory. ﻿﻿﻿For 20 years, my husband, Walt, had longed to visit the fabled spring-fed swimming pool at Balmorhea State Park. For just as long, I’d yearned for a view of the night skies from McDonald Obser­va­tory, high in the Davis Mountains. Early last fall, in the final days of a searing heat wave, we were able to catch both on one trip. Our itinerary required some planning plus some luck, involving the confluence of warm weather for swimming and dark skies for stargazing, not to mention availability of the particular lodgings and telescope we had in mind. These converged on Oct. 4. Early that morning, fingers crossed for continued heat and no rain, we set out from Austin heading west under ominous gray skies. I never tire of the dramatic landscape of bluffs and mesas thrusting starkly from the flat Edwards Plateau bedrock along that scenic route. Near Bakersfield, where vast wind farms loom mysteriously on the horizon, the clouds began to dissipate, to our great relief. We arrived at Balmorhea State Park with perfectly glorious Texas autumn weather. 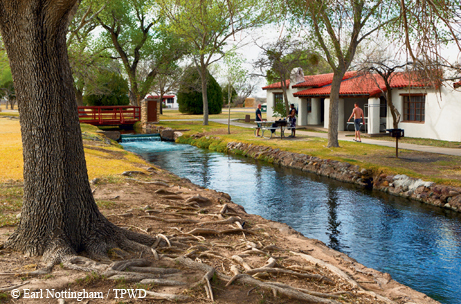 ﻿Water from Balmorhea’s San Solomon Springs flows past the park’s motor courts. Realizing we’d have limited time to enjoy the celebrated pool under peak conditions, we checked in quickly with the ranger on duty, then beelined for our assigned rooms to drop off luggage and grab swim gear. Once poolside, Walt donned snorkel and fins. I opted to luxuriate in a sun-drenched shallow spot near the edge while my husband swam with channel catfish, soft-shelled turtles, rare pupfish and other creatures unidentified. FDR’s Civilian Conservation Corps built the 46-acre state park in the 1930s, channeling San Solomon Springs’ headwaters to create an anticipated tourist attraction. The Spanish Colonial-style motor courts, constructed at the same time, beckoned to an adventurous new breed of motorcar travelers. More recently, the park’s Cienega Project restored a swath of the original desert wetlands to provide habitat for two indigenous endangered fish species: the Comanche Springs pupfish and the Pecos gambusia. Three aquarium-style windows in the cienega wall allow visitors a fish-eye view of these and other denizens of the springs. Dipping sun and temperatures drew us from the water around dinner time. We ate at El Cueva de Oso (Bear’s Den) restaurant in Balmorhea, a converted residence with an associated motel next door. It was packed, and for good reason: the food is excellent, and the portions are generous. It was dark by the time we finished eating, so it was time to retire to our cozy park lodgings, which have undergone recent renovations. After breakfast the next day, we headed south on Texas Highway 17 for the 37-mile drive to Fort Davis (pop. 1,200), enjoying scenery now transformed from Edwards limestone to the red volcanic rock of the Trans-Pecos. Once there, we proceeded directly up the steep road leading to the McDonald Observatory. Though the temperature had dropped into the 60s, crisp air and sunny skies boded well as we reached our first stop: the Frank N. Bash Visitors Center. Set on a broad expanse of level land, the sprawling complex includes a main building with kid-friendly astronomy exhibits, a theater, a gift shop and the Star Date Cafe. 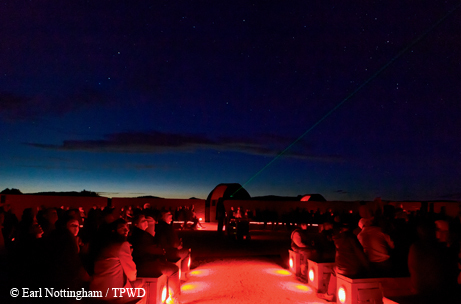 Outdoors, a “telescope garden” and 450-seat amphitheater welcome crowds to the center’s ever-popular Star Parties. ﻿﻿Visitors take a tour of the night sky at a McDon­ald Observatory Star Party. We arrived early enough to catch a SunScope presentation in the indoor theater. Few people have ever had a chance to directly observe our nearest star’s dynamic, shimmering surface with its alluring dark spots and spectacular flares. The observatory’s specialized computer-driven telescope continually tracks the sun, bringing that experience to the screen, magnified, in real time. For the next 40 minutes, we sat enthralled at the images unfolding before us, while friendly, knowledgeable staff member Kevin Mace explained them to us. Following the show, Mace announced a guided telescope tour at the Harlan J. Smith Telescope. The 107-inch mirrored instrument, the observatory’s second-largest, sits atop Mount Locke at 7,000 feet and can be reached by shuttle or car. Since we would be staying at the Astronomer’s Lodge on the mountain, we drove. Once reconvened at the domed building that houses the telescope, our group proceeded to the fifth-floor observation room. The vast space immediately drew our gaze upward to the narrow slit in the 76-foot-diameter rotating dome through which the great telescope peers out at the universe. An equatorial mounting enables it to fix on any object in the visible sky and to move in phase with the Earth’s rotation to keep the celestial target in view. Astronomers do no direct stargazing here. They operate the telescope by computer from a closed control room, and receive the information it sends back in digital form. Next tour stop: the world-famous Hobby-Eberly Telescope atop nearby Mount Fowlkes, readily spotted by its showy 86-foot silvered geodesic dome. With a 433-inch composite mirror made up of 91 separate hexagonal mirrors and an open-truss design, the giant instrument is viewed through a panoramic window. It’s permanently tilted at 55 degrees above the horizon and is dedicated to spectrographic analysis of distant celestial phenomena. Researchers worldwide with scheduled projects needn’t even be present; they receive the results of a night’s work via email. For all the excitement of high-tech research, Walt and I craved a more up-close-and-personal encounter with West Texas’ renowned dark skies. That night’s special viewing would provide that opportunity. Apart from its three-times-weekly star parties, McDonald Observatory offers irregularly scheduled special viewing events to allow smaller groups to experience astronomical observation through one of the observatory’s research telescopes. Of the three telescopes available in the program, we had chosen the smallest, a 36-inch reflector, the only one equipped for direct visual observation. We checked in at the Astronomer’s Lodge just before 5 p.m. Cozily tucked among the hills, the low-slung building accommodates visiting scientists during their stays and tourists attending special viewings, on a space-available basis. It has 16 plain yet comfortable rooms, a kitchen and a general dining area. There are rules. No noise (people are sleeping at all hours). No lights in the dormitory hall, which is softly illuminated in red. Notes posted at the bedroom windows remind guests to pull the heavy dark shades tightly at dusk. Light pollution is taken seriously here. The lodge serves a hot lunch and dinner and a casual do-it-yourself-anytime breakfast. We picked a table by the panoramic south-facing window so we could enjoy the spectacular view as daylight faded to dusk. As dark approached, well-bundled against a now-chilly night, we walked the short distance uphill to the telescope to join the viewing group. Seated in a semicircle within the intimate brick observatory, a dozen of us took turns at the eyepiece while our guide, Dave Oesper, explained each feature as we viewed it. Binary stars, globular clusters, galaxies, nebulae, planets and moons of planets thrilled our eyes through the lens, while outside, framed by the wide-open doorway, the canopy of stars blazed fiery against a black, moonless sky. The 3½-hour-long program — broken only by a short break for hot cider and cookies — flew by. When it finally came to a close, near midnight, Walt and I lingered outside awhile to take in the glory of the Milky Way, a rare treat for urban dwellers. The next morning we took a light breakfast in the company of an affable space scientist who studies lunar laser ranging. We’d anticipated a hike afterward, but the Davis Mountains State Park trails were closed for maintenance. So we devised a Plan B to check out Alpine, a town new to us. Arriving there with no particular destination in mind, we quickly discovered the Museum of the Big Bend. Located on the Sul Ross State University campus, it documents the record of the Native American, Spanish, Mexican and American cultures that inhabited the area’s vast spaces from as far back as 11,000 years ago. The museum’s exhibits and special collections cover regional anthropology, history, natural history and art. We had the good fortune to catch a traveling exhibition of Western paintings and bronzes by Frederic Remington (1861-1909), the New Yorker whose work did so much to shape the popular image of the American Wild West. We would have happily spent more time exploring Alpine, had not the long drive ahead called us back to the highway. But with the charms of western Texas never-ending, I’m certain that we’ll pass that way again.